Friday, September 21, 2018 mark 131 days since the Swift Current Broncos hoisted the Ed Chynoweth Cup in front of their faithful fans following an incredible 26-game playoff run. With a flurry of offseason moves and the 2018 Western Hockey League pre-season schedule now behind us, the league’s play-by-play broadcasters have been tracking the changes to their team’s rosters and the other clubs throughout the league. Now, they’re ready to offer their well-informed thoughts as they prepare to hit the road with their respective WHL clubs, looking to play deep into spring and earn the right to compete at the 2019 Mastercard Memorial Cup in Halifax, N.S. With that in mind and the votes tabulated, the results were as follows. The Spokane Chiefs are set to return to the top of the WHL and capture the Ed Chynoweth Cup in May of 2019 according to the league’s broadcasters. Of the votes that were submitted, 60 per cent favoured the Chiefs, who ranked sixth on the pre-season edition of the CHL Top 10 Rankings just a few days ago. The only Eastern Conference team to earn a nod were the Lethbridge Hurricanes, who captured 26.67 per cent of the vote. Also earning votes were the Everett Silvertips and Vancouver Giants. While the Hurricanes earned some consideration for the WHL Championship, they were the definite favourite to come out of the Eastern Conference, earning 40 per cent of votes for who would be the runner up. 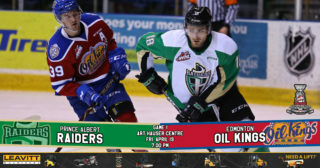 The Chiefs were also mentioned twice in the discussion, as were the East Division’s Prince Albert Raiders. Also earning consideration were the Giants, Regina Pats, Portland Winterhawks, Medicine Hat Tigers, and Brandon Wheat Kings. When it came to naming division winners, there was only one tight race, existing the East Division. 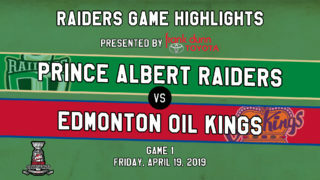 The Wheat Kings led the way with 46.66 per cent of votes cast while the Raiders captured 33.33 per cent of the ballots themselves. Of the six teams to choose from in the division, five earned a vote with the Regina Pats, Swift Current Broncos, and Saskatoon Blades earning a single vote. The Hurricanes put their support behind the Hurricanes to rise to the top of the Central Division, earning 80 per cent of votes cast. A solid 20 per cent predicted the Medicine Hat Tigers to win their third-straight division title. In the Western Conference, the Giants and Chiefs reigned supreme among those on the airwaves. The Giants claimed 80 per cent of possible votes in their division with the Kamloops Blazers and Victoria Royals also earning recognition. Finally, the U.S. Division votes provided the Spokane Chiefs with the top spot, claiming 73.33 per cent of the votes available. The Winterhawks also earned multiple votes while the Silvertips and Tri-City Americans were mentioned as potential division favourites. From those selections came the winner of the Scotty Munro Memorial Trophy as the WHL’s Regular Season champions with the Hurricanes and Chiefs both earning 40 per cent of the ballots cast. The Silvertips and Giants also claimed votes. Asked to project the number of victories the top-ranked club would get worked out to an average of 49 wins in the new 68-game schedule. Broadcasters projected the Bob Clark Trophy would be won by a player in the Central Division for the first time since Linden Vey won it as a member of the Medicine Hat Tigers in the 2010-11 WHL Regular Season. Hurricanes captain and Pittsburgh Penguins prospect Jordy Bellerive was mentioned as the WHL’s Top Scorer in 33.33 per cent of the votes cast. The vote wasn’t a clear cut victory though as Portland Winterhawks forward and Vegas Golden Knights prospect Cody Glass earned 26.67 per cent of votes cast. Another pair of star forwards earned a pair of votes each as Brandon Wheat Kings captain Stelio Mattheos and Chiefs forward Jaret Anderson-Dolan had recognition bestowed upon them. While it’s very likely that one of the four above-mentioned names captures the award, a pair of youngsters drew recognition with Jim Piggott Memorial Trophy winner Dylan Cozens and his Hlinka Gretzky Cup teammate Peyton Krebs of the Kootenay ICE earning a single vote. With the broadcasters polled to project the number of points that would win a player the trophy this season as well, the average came out to 106 points, with no one projected to surpass Jayden Halbgewach’s total of 129 points from last season. With overwhelming support, WHL broadcasters projected the Bill Hunter Memorial Trophy, awarded to the WHL’s Top Defenceman, to remain in Lloydminster, Alta. for a second-straight season with Ty Smith earning this year’s honour. The first-round selection of the New Jersey Devils from the 2018 NHL Draft commanded 73.33 per cent of the votes. Red Deer Rebels defenceman Alexander Alexeyev was the next strongest pick, earning a pair of votes. Hurricanes defenceman and Penguins prospect Calen Addison earned a vote for the award while one broadcaster selected 2019 NHL Draft prospect Bowen Byram to rise among his fellow blueliners. Last year, the broadcasters had an easy time in picking the winner of the Del Wilson Memorial Trophy as the WHL Goaltender of the Year. This year was a much different case as seven different goaltenders received votes for the top honour. Arizona Coyotes prospect and Giants goaltender David Tendeck earned 26.67 per cent of votes cast. One of the bold predictions came in a third of broadcasters selecting a goaltender from the Eastern Conference to win the award, led by Raiders netminder and Toronto Maple Leafs prospect Ian Scott capturing 20 per cent of all votes cast. Also earning consideration were Max Paddock and Nolan Maier from the Regina Pats and Saskatoon Blades respectively. Nearly half the votes were cast in favour of B.C. 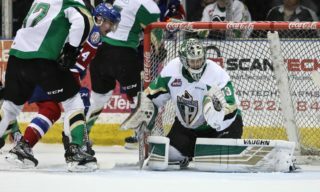 Division goaltenders as Vegas Golden Knights prospect and Kamloops Blazers puckstopper Dylan Ferguson claimed a pair of votes. Victoria Royals goaltender Griffen Outhouse also received a vote. The remaining 20 per cent were confident that the trophy would remain property of the Everett Silvertips for another year though, with sophomore goaltender Dustin Wolf rising to the challenge and capture the award. With a strong crop of players readily available for the 2019 NHL Draft, the Central Division was also the focus of broadcasters for the winner of the Jim Piggott Memorial Trophy as the WHL’s Rookie of the Year. Connor McClennon and Jake Neighbours of the Kootenay ICE and Edmonton Oil Kings respectively tied with 20 per cent of the votes each, adding more fuel to this year’s competition in a hotly-contested division. Justin Sourdif, already a champion from the 2017 WHL Cup and the third overall selection from the 2017 WHL Bantam Draft earned a pair of votes to follow close behind. Seven other players earned votes in the category, including the first overall selection from the 2017 WHL Bantam Draft, Raiders defenceman Kaiden Guhle. A third of broadcasters selected Brent Kisio to join his father Kelly as a winner of the Dunc McCallum Memorial Trophy this season. The Hurricanes bench boss faced a significant challenge from Chiefs head coach Dan Lambert, who captured 26.67 per cent of ballots cast. 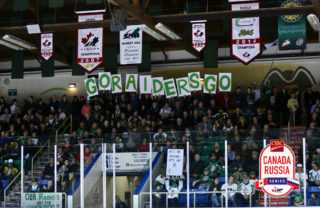 Marc Habscheid from the Raiders earned a pair of votes while the quartet of Matt O’Dette, Dennis Williams, Mitch Love, and Michael Dyck earned votes. The vote for the Lloyd Saunders Memorial Trophy as the WHL Executive of the Year went to Hurricanes General Manager Peter Anholt who, like Kisio, earned a third of votes cast. Last season’s winner, Garry Davidson of the Silvertips, claimed a vote. Chiefs General Manager Scott Carter captured 20 per cent of votes cast while Raiders General Manager Curtis Hunt earned a pair of votes. Grant Armstrong from the Wheat Kings, Mike Johnston from the Winterhawks, and Jeff Chynoweth from the Calgary Hitmen were also recognized in the vote. The final question posed to WHL broadcasters focused on the 2019 NHL Draft and determining the top three WHL players selected at this June’s draft in Vancouver, B.C. To no surprise, Cozens led the way with 37 per cent of the vote, followed closely by Giants defenceman Bowen Byram who earned 27 per cent of the votes cast through a points system that awarded three, two, and one points to players as they were ranked the highest, second highest, or third highest respectively. Rounding out the top three was ICE forward Peyton Krebs while Saskatoon Blades forward Kirby Dach was close behind with 13 per cent. Earning some support for the draft causes were Nolan Foote of the Kelowna Rockets, Sasha Mutala of the Americans, defenceman Matthew Robertson of the Oil Kings, and Wheat Kings defender Braden Schneider. Asked to project where those players will be selected in June 2019, broadcasters estimated that the top WHL player selected will go no later than third overall with the next WHL players selected seventh of 8th overall and the third going by 12th overall. Of those that responded, more than half expected the top three WHL players to be selected in the Top 10 of the 2019 NHL Draft. With all that said, we’ll give some of these takes time to cool as the puck drops on the 53rd season of the WHL. Action begins Friday September 21 with eight games kicking off the season for 16 WHL clubs.